Welcome to Cleveland Machinery Sales, Inc., dealers in quality new and used machine tools, including lathes, mills, drills, grinders, saws and most other metalworking equipment. Since 1946, over three generations our team has worked to earn an outstanding reputation for quality, service, and integrity; building long term relationships with our customers and doing whatever is necessary to meet their machinery needs. 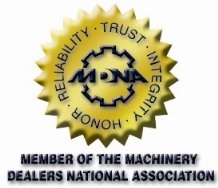 We carry a large inventory of quality used machinery. With over 40,000 square feet of the cleanest warehouse space in Cleveland, we are able to fill any and all of your machinery and equipment requirements. We Buy - Sell - Trade One Machine or Entire Plant!